Dolores Maria Rossman has spent the majority of her adult life working in three areas: global and local entrepreneurial ventures; health promotion as a nutritionist and gerontologist; and as Family Caregiver. While caring for others she also finds time to bicycle all over Seattle with her distinctive helmet gear and bright yellow jacket. Dolores feels strongly about contributing to her own family and to her community family. As a Consultant to Casa Latina she has taught immigrant Latinos how to become homecare workers for older adults. A few years ago, as sole caregiver for her husband, a surviving World War II Veteran, who was going through health challenges, her care responsibilities were overwhelming. As a result, she fell into a severe depression. In her youth and as an adult, she had been a caregiver for her aging mother. She consistently had to be strong for others, never admitting when she needed help, never focusing on the small things to enrich her own life. But today, she tells how her willingness to ask for help led her to a local mental health clinic, “Where a very kind and professional therapist suggested hospital in-patient treatment.” For several weeks Dolores resided in Harborview’s “psych unit”, a place she never in her wildest dreams thought she would land. Her first class was watercolor painting. She had never painted with watercolors and was very nervous, feeling quite intimidated. During the first class, however, teaching artist Patrick Howe was instrumental in giving students confidence in learning watercolor painting techniques with expert and supportive instruction. Path with Art classes have included Writing Loss and The Writer’s Voice. In September, Dolores performed as a siren in Public Works Seattle’s production of The Odyssey at the Seattle Repertory Theatre. This was a collaborative production that involved multiple organizations throughout the city of Seattle. According to Dolores, this experience has been one of the highlights of her life as a “late bloomer”: the community she’s built, the dear friends she has made, and the production itself. Most recently Dolores completed Crafting your Narrative: The Power of our Stories, taught by Caroline Brown. This class used writing and public speaking as a tool to explore, shape, and share one’s experiences with others. Dolores performed her personal narrative and her struggles in a presentation at Theater Schmeater. “To actually write about how I went down into a deep depression was really hard… I’ve always been very upbeat, my entire life, and it was like I didn’t even know who I was. After writing the story out, when I read it, I cried. I really cried. 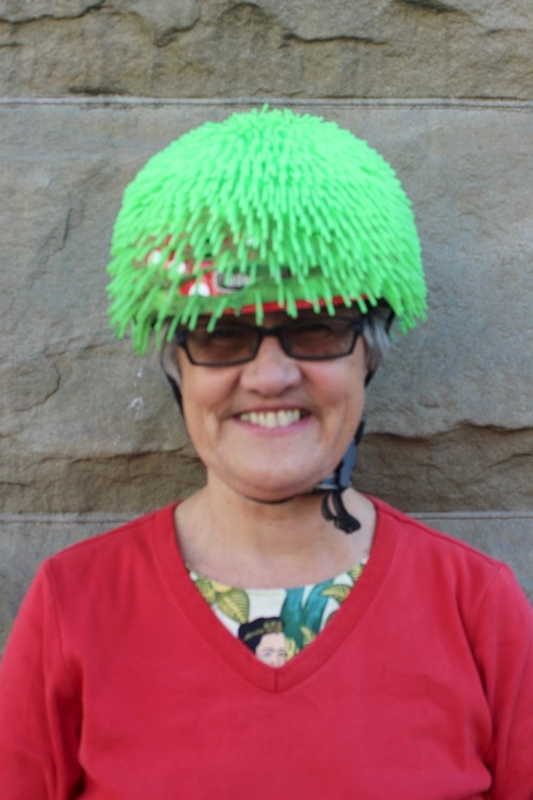 But it was such a supportive group that, afterwards, I felt relieved… When we finished the class, I dawned my bright yellow helmet, and hopped on to my bicycle to ride home. It was a beautifully sunny, Seattle autumn day, and I felt my heart bursting with joy! Why? Because when you have survived such a traumatic health experience, and you have the opportunity to take Path with Art classes, you know you are blessed”.